1800 series machines in the coating kitchen of a high quality magazine paper manufacturer. 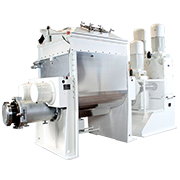 These units, fitted with helical pumps, have so increased the strained quality that the scrap rate has fallen drastically giving increased paper output and higher overall quality. Normal through-put of 6000 litres/hour is obtained. 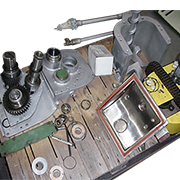 The standard production unit for a wide variety of materials and applications. 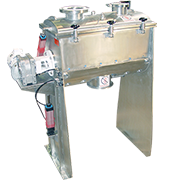 This unit is designed to be fitted with gear pumps, Helical pumps or diaphragm pumps to provide outputs in the range 0 – 4500 litres per hour or 0 – 6000 litres per hour. 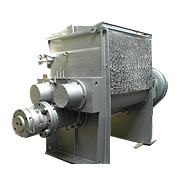 The unit may be supplied in a variety of materials and for suction/gravity feeding or gravity feed alone. Continuous Operation The Jenag Series 1800 and 3000 strainers are particularly suitable for high-volume, continuous-flow operations with outputs up to 6000 litres per hour and 12000 litres per hour respectively. Once set up to provide the required flow rates of output and backwash, they can operate continuously without further supervision. 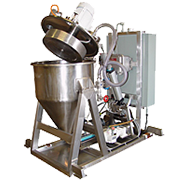 Sludge may be dropped from the machine at the end of the working shift or even whilst the machine is in operation, should this be necessary. 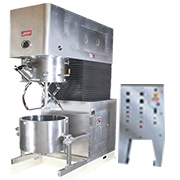 The units may be connected directly to a weight operated filling machine for automatic operation or with the addition of a simple automatic control system, to a volume operated system. 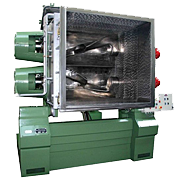 Once connected the output from the Jenag strainer will be automatically controlled by the demand of the filling machine itself. 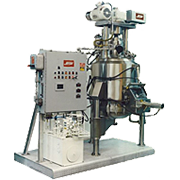 The JENAG is inherently safe as highly volatile and toxic substances can be safely contained within its totally enclosed system. There can be no overflowing and no pressure build-up. Should a blockage of the mesh occur at any time, the backwashing pressure falls to zero; a safety feature which also protects the mesh and enables its continued use. 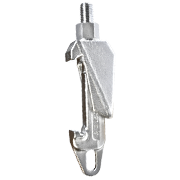 Even under adverse operating conditions high pressures are automatically relieved by the sprung loaded backwashing circuit. The range of strainers can provide through-puts from 0 - 12000 litres per hour from four basic frame sizes which will be selected to suit a customer's particular requirements. Within each frame size several options are available to suit varying delivery, discharge and product needs. These can include different pump types and sizes, whether or not an input pump is to be fitted and a variety of materials of construction. In all cases an output pump is standard, and the output can be pumped up to 100 metres from the strainer. 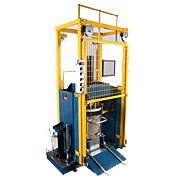 Due to the design of the units they can be used for products of low or relatively high viscosity and for normal or shear sensitive products. 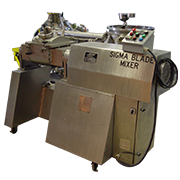 The totally enclosed system enables materials with highly volatile elements to be handled without difficulty, and enables the units to be shut down when full of product without any subsequent problems. 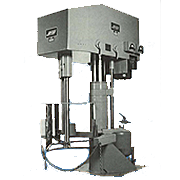 The largest strainers are able to provide sufficient output for any but the very largest of automatic filling units. 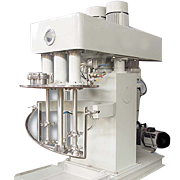 Each machine is a complete, mobile, purpose-built, straining unit requiring only connection of its fluid lines and to a power source. 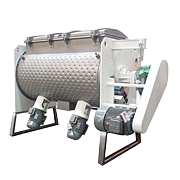 Primarily the unit consists of a filter body which houses two, vertical, perforated strainer plates. Between these a monofilament strainer mesh is sandwiched. 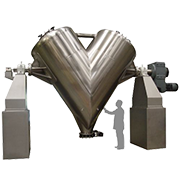 The liquid to be strained is introduced to the strainer body either by gravity feed from an overhead tank or by suction pump from a ground level vat. Once introduced to the body, the material is sucked through the mesh by an output pump. 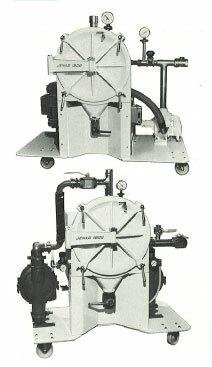 A small quantity of the cleaned output is returned to the rear of the body to an intense and unique self-cleaning or back-flushing action which ensures the mesh remains permanently clear and free from blockage. An output valve simply provides an infinitely variable throughput as desired, and a sludge valve enables the removal of unwanted contaminants at periodic intervals depending upon the liquid being treated. 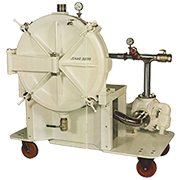 When the Jenag strainer is fed by a pump from a ground-level vessel, a by-pass is provided from the input side of the unit back to the vat. 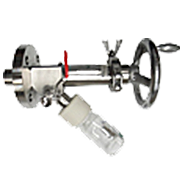 This allows the output valve to be closed, in this or the gravity feed mode, without the need to switch off the strainer itself. The heart of the Jenag strainer is a monofilament mesh which is selected to give the required degree of straining. 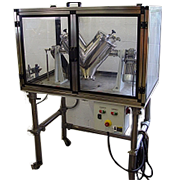 This mesh, being enclosed within the strainer body, is protected from mechanical damage and is kept clean by the self-cleaning action of the unit As a consequence, the mesh has a long life and may be used over and over again. The unit price of the mesh is low and cost is therefore a minimum. The only other parts subject to wear are two seals within the body itself and in the rotary union connection to the back-wash system. These are designed for long life and are low cost items. Change over from one product to another can be effected rapidly and with little product loss, which allows high effective utilization of the unit. Overall the unit is cost effective and compares very favourably with other systems or the use of filter bags or socks. 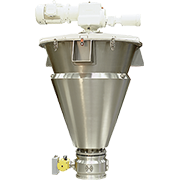 To allow for handling a wide variety of products Jenag strainers can be provided to a choice of specifications. Materials of Construction - Standard supply is with the strainer body in aluminium but hard-anodised aluminium, gun-metal or stainless steel bodies may be selected. 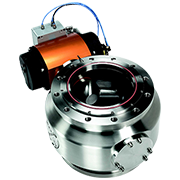 Pumps - These may be rotary, helical or diaphragm/air operated of suitable materials to suit the product and application. Feed System - By gravity, when the unit will be fitted with an output pump only or suitable for gravity or suction feeding when an input pump will be fitted as an integral unit. Electrical Enclosure - Normally flameproof to U.K. standards, or explosion-proof to German standard. Alternatives are available to meet other requirements. Where ultrafine filtration is required the Jenag can be supplied fitted with a filter bag or cartridge unit at the outlet. 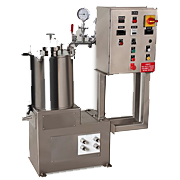 This arrangement greatly reduces consumption of cartridges or bags.